As we learned in the previous section, stress—especially if it is chronic—takes a toll on our bodies and can have enormously negative health implications. When we experience events in our lives that we appraise as stressful, it is essential that we use effective coping strategies to manage our stress. Coping refers to mental and behavioral efforts that we use to deal with problems relating to stress, including its presumed cause and the unpleasant feelings and emotions it produces. Lazarus and Folkman (1984) distinguished two fundamental kinds of coping: problem-focused coping and emotion-focused coping. In problem-focused coping, one attempts to manage or alter the problem that is causing one to experience stress (i.e., the stressor). Problem-focused coping strategies are similar to strategies used in everyday problem-solving: they typically involve identifying the problem, considering possible solutions, weighing the costs and benefits of these solutions, and then selecting an alternative (Lazarus & Folkman, 1984). As an example, suppose Bradford receives a midterm notice that he is failing statistics class. If Bradford adopts a problem-focused coping approach to managing his stress, he would be proactive in trying to alleviate the source of the stress. He might contact his professor to discuss what must be done to raise his grade, he might also decide to set aside two hours daily to study statistics assignments, and he may seek tutoring assistance. A problem-focused approach to managing stress means we actively try to do things to address the problem. Emotion-focused coping, in contrast, consists of efforts to change or reduce the negative emotions associated with stress. These efforts may include avoiding, minimizing, or distancing oneself from the problem, or positive comparisons with others (“I’m not as bad off as she is”), or seeking something positive in a negative event (“Now that I’ve been fired, I can sleep in for a few days”). In some cases, emotion-focused coping strategies involve reappraisal, whereby the stressor is construed differently (and somewhat self-deceptively) without changing its objective level of threat (Lazarus & Folkman, 1984). For example, a person sentenced to federal prison who thinks, “This will give me a great chance to network with others,” is using reappraisal. If Bradford adopted an emotion-focused approach to managing his midterm deficiency stress, he might watch a comedy movie, play video games, or spend hours on Twitter to take his mind off the situation. In a certain sense, emotion-focused coping can be thought of as treating the symptoms rather than the actual cause. While many stressors elicit both kinds of coping strategies, problem-focused coping is more likely to occur when encountering stressors we perceive as controllable, while emotion-focused coping is more likely to predominate when faced with stressors that we believe we are powerless to change (Folkman & Lazarus, 1980). Clearly, emotion-focused coping is more effective in dealing with uncontrollable stressors. For example, if at midnight you are stressing over a 40-page paper due in the morning that you have not yet started, you are probably better off recognizing the hopelessness of the situation and doing something to take your mind off it; taking a problem-focused approach by trying to accomplish this task would only lead to frustration, anxiety, and even more stress. Fortunately, most stressors we encounter can be modified and are, to varying degrees, controllable. A person who cannot stand her job can quit and look for work elsewhere; a middle-aged divorcee can find another potential partner; the freshman who fails an exam can study harder next time, and a breast lump does not necessarily mean that one is fated to die of breast cancer. The desire and ability to predict events, make decisions, and affect outcomes—that is, to enact control in our lives—is a basic tenet of human behavior (Everly & Lating, 2002). Albert Bandura (1997) stated that “the intensity and chronicity of human stress is governed largely by perceived control over the demands of one’s life” (p. 262). As cogently described in his statement, our reaction to potential stressors depends to a large extent on how much control we feel we have over such things. Perceived control is our beliefs about our personal capacity to exert influence over and shape outcomes, and it has major implications for our health and happiness (Infurna & Gerstorf, 2014). Extensive research has demonstrated that perceptions of personal control are associated with a variety of favorable outcomes, such as better physical and mental health and greater psychological well-being (Diehl & Hay, 2010). Greater personal control is also associated with lower reactivity to stressors in daily life. For example, researchers in one investigation found that higher levels of perceived control at one point in time were later associated with lower emotional and physical reactivity to interpersonal stressors (Neupert, Almeida, & Charles, 2007). Further, a daily diary study with 34 older widows found that their stress and anxiety levels were significantly reduced on days during which the widows felt greater perceived control (Ong, Bergeman, & Bisconti, 2005). When we lack a sense of control over the events in our lives, particularly when those events are threatening, harmful, or noxious, the psychological consequences can be profound. 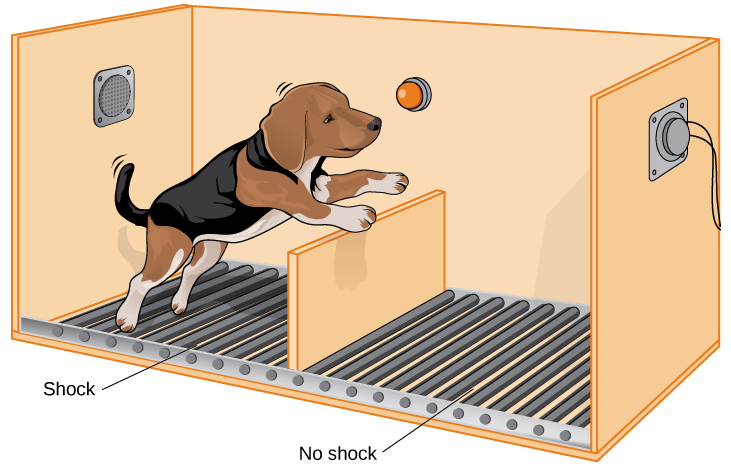 In one of the better illustrations of this concept, psychologist Martin Seligman conducted a series of classic experiments in the 1960s (Seligman & Maier, 1967) in which dogs were placed in a chamber where they received electric shocks from which they could not escape. Later, when these dogs were given the opportunity to escape the shocks by jumping across a partition, most failed to even try; they seemed to just give up and passively accept any shocks the experimenters chose to administer. In comparison, dogs who were previously allowed to escape the shocks tended to jump the partition and escape the pain ([link]). Seligman’s learned helplessness experiments with dogs used an apparatus that measured when the animals would move from a floor delivering shocks to one without. Seligman believed that the dogs who failed to try to escape the later shocks were demonstrating learned helplessness: They had acquired a belief that they were powerless to do anything about the noxious stimulation they were receiving. Seligman also believed that the passivity and lack of initiative these dogs demonstrated was similar to that observed in human depression. Therefore, Seligman speculated that acquiring a sense of learned helplessness might be an important cause of depression in humans: Humans who experience negative life events that they believe they are unable to control may become helpless. As a result, they give up trying to control or change the situation and some may become depressed and show lack of initiative in future situations in which they can control the outcomes (Seligman, Maier, & Geer, 1968). Seligman and colleagues later reformulated the original learned helplessness model of depression (Abramson, Seligman, & Teasdale, 1978). In their reformulation, they emphasized attributions (i.e., a mental explanation for why something occurred) that lead to the perception that one lacks control over negative outcomes are important in fostering a sense of learned helplessness. For example, suppose a coworker shows up late to work; your belief as to what caused the coworker’s tardiness would be an attribution (e.g., too much traffic, slept too late, or just doesn’t care about being on time). The reformulated version of Seligman’s study holds that the attributions made for negative life events contribute to depression. Consider the example of a student who performs poorly on a midterm exam. This model suggests that the student will make three kinds of attributions for this outcome: internal vs. external (believing the outcome was caused by his own personal inadequacies or by environmental factors), stable vs. unstable (believing the cause can be changed or is permanent), and global vs. specific (believing the outcome is a sign of inadequacy in most everything versus just this area). Assume that the student makes an internal (“I’m just not smart”), stable (“Nothing can be done to change the fact that I’m not smart”) and global (“This is another example of how lousy I am at everything”) attribution for the poor performance. The reformulated theory predicts that the student would perceive a lack of control over this stressful event and thus be especially prone to developing depression. Indeed, research has demonstrated that people who have a tendency to make internal, global, and stable attributions for bad outcomes tend to develop symptoms of depression when faced with negative life experiences (Peterson & Seligman, 1984). Seligman’s learned helplessness model has emerged over the years as a leading theoretical explanation for the onset of major depressive disorder. When you study psychological disorders, you will learn more about the latest reformulation of this model—now called hopelessness theory. People who report higher levels of perceived control view their health as controllable, thereby making it more likely that they will better manage their health and engage in behaviors conducive to good health (Bandura, 2004). Not surprisingly, greater perceived control has been linked to lower risk of physical health problems, including declines in physical functioning (Infurna, Gerstorf, Ram, Schupp, & Wagner, 2011), heart attacks (Rosengren et al., 2004), and both cardiovascular disease incidence (Stürmer, Hasselbach, & Amelang, 2006) and mortality from cardiac disease (Surtees et al., 2010). In addition, longitudinal studies of British civil servants have found that those in low-status jobs (e.g., clerical and office support staff) in which the degree of control over the job is minimal are considerably more likely to develop heart disease than those with high-status jobs or considerable control over their jobs (Marmot, Bosma, Hemingway, & Stansfeld, 1997). The link between perceived control and health may provide an explanation for the frequently observed relationship between social class and health outcomes (Kraus, Piff, Mendoza-Denton, Rheinschmidt, & Keltner, 2012). In general, research has found that more affluent individuals experience better health mainly because they tend to believe that they can personally control and manage their reactions to life’s stressors (Johnson & Krueger, 2006). Perhaps buoyed by the perceived level of control, individuals of higher social class may be prone to overestimating the degree of influence they have over particular outcomes. For example, those of higher social class tend to believe that their votes have greater sway on election outcomes than do those of lower social class, which may explain higher rates of voting in more affluent communities (Krosnick, 1990). Other research has found that a sense of perceived control can protect less affluent individuals from poorer health, depression, and reduced life-satisfaction—all of which tend to accompany lower social standing (Lachman & Weaver, 1998). Taken together, findings from these and many other studies clearly suggest that perceptions of control and coping abilities are important in managing and coping with the stressors we encounter throughout life. The need to form and maintain strong, stable relationships with others is a powerful, pervasive, and fundamental human motive (Baumeister & Leary, 1995). Building strong interpersonal relationships with others helps us establish a network of close, caring individuals who can provide social support in times of distress, sorrow, and fear. Social support can be thought of as the soothing impact of friends, family, and acquaintances (Baron & Kerr, 2003). Social support can take many forms, including advice, guidance, encouragement, acceptance, emotional comfort, and tangible assistance (such as financial help). Thus, other people can be very comforting to us when we are faced with a wide range of life stressors, and they can be extremely helpful in our efforts to manage these challenges. Even in nonhuman animals, species mates can offer social support during times of stress. For example, elephants seem to be able to sense when other elephants are stressed and will often comfort them with physical contact—such as a trunk touch—or an empathetic vocal response (Krumboltz, 2014). Scientific interest in the importance of social support first emerged in the 1970s when health researchers developed an interest in the health consequences of being socially integrated (Stroebe & Stroebe, 1996). Interest was further fueled by longitudinal studies showing that social connectedness reduced mortality. In one classic study, nearly 7,000 Alameda County, California, residents were followed over 9 years. Those who had previously indicated that they lacked social and community ties were more likely to die during the follow-up period than those with more extensive social networks. Compared to those with the most social contacts, isolated men and women were, respectively, 2.3 and 2.8 times more likely to die. These trends persisted even after controlling for a variety of health-related variables, such as smoking, alcohol consumption, self-reported health at the beginning of the study, and physical activity (Berkman & Syme, 1979). Since the time of that study, social support has emerged as one of the well-documented psychosocial factors affecting health outcomes (Uchino, 2009). A statistical review of 148 studies conducted between 1982 and 2007 involving over 300,000 participants concluded that individuals with stronger social relationships have a 50% greater likelihood of survival compared to those with weak or insufficient social relationships (Holt-Lunstad, Smith, & Layton, 2010). According to the researchers, the magnitude of the effect of social support observed in this study is comparable with quitting smoking and exceeded many well-known risk factors for mortality, such as obesity and physical inactivity ([link]). A number of large-scale studies have found that individuals with low levels of social support are at greater risk of mortality, especially from cardiovascular disorders (Brummett et al., 2001). Further, higher levels of social supported have been linked to better survival rates following breast cancer (Falagas et al., 2007) and infectious diseases, especially HIV infection (Lee & Rotheram-Borus, 2001). In fact, a person with high levels of social support is less likely to contract a common cold. In one study, 334 participants completed questionnaires assessing their sociability; these individuals were subsequently exposed to a virus that causes a common cold and monitored for several weeks to see who became ill. Results showed that increased sociability was linearly associated with a decreased probability of developing a cold (Cohen, Doyle, Turner, Alper, & Skoner, 2003). For many of us, friends are a vital source of social support. But what if you found yourself in a situation in which you lacked friends or companions? For example, suppose a popular high school student attends a far-away college, does not know anyone, and has trouble making friends and meaningful connections with others during the first semester. What can be done? If real life social support is lacking, access to distant friends via social media may help compensate. In a study of college freshmen, those with few face-to-face friends on campus but who communicated electronically with distant friends were less distressed that those who did not (Raney & Troop-Gordon, 2012). Also, for some people, our families—especially our parents—are a major source of social support. Social support appears to work by boosting the immune system, especially among people who are experiencing stress (Uchino, Vaughn, Carlisle, & Birmingham, 2012). In a pioneering study, spouses of cancer patients who reported high levels of social support showed indications of better immune functioning on two out of three immune functioning measures, compared to spouses who were below the median on reported social support (Baron, Cutrona, Hicklin, Russell, & Lubaroff, 1990). Studies of other populations have produced similar results, including those of spousal caregivers of dementia sufferers, medical students, elderly adults, and cancer patients (Cohen & Herbert, 1996; Kiecolt-Glaser, McGuire, Robles, & Glaser, 2002). In addition, social support has been shown to reduce blood pressure for people performing stressful tasks, such as giving a speech or performing mental arithmetic (Lepore, 1998). In these kinds of studies, participants are usually asked to perform a stressful task either alone, with a stranger present (who may be either supportive or unsupportive), or with a friend present. Those tested with a friend present generally exhibit lower blood pressure than those tested alone or with a stranger (Fontana, Diegnan, Villeneuve, & Lepore, 1999). In one study, 112 female participants who performed stressful mental arithmetic exhibited lower blood pressure when they received support from a friend rather than a stranger, but only if the friend was a male (Phillips, Gallagher, & Carroll, 2009). Although these findings are somewhat difficult to interpret, the authors mention that it is possible that females feel less supported and more evaluated by other females, particularly females whose opinions they value. Taken together, the findings above suggest one of the reasons social support is connected to favorable health outcomes is because it has several beneficial physiological effects in stressful situations. However, it is also important to consider the possibility that social support may lead to better health behaviors, such as a healthy diet, exercising, smoking cessation, and cooperation with medical regimens (Uchino, 2009). While having social support is quite beneficial, being the recipient of prejudicial attitudes and discriminatory behaviors is associated with a number of negative outcomes. In their literature review, Brondolo, Brady, Pencille, Beatty, and Contrada (2009) describe how racial prejudice and discrimination serve as unique, significant stressors for those who are the targets of such attitudes and behavior. Being the target of racism is associated with increased rates of depression, lowered self-esteem, hypertension, and cardiovascular disease. Given the complex and pervasive nature of racism as a stressor, Brondolo et al. (2009) point out the importance of coping with this specific stressor. Their review is aimed at determining which coping strategies are most effective at offsetting negative health outcomes associated with racism-related stress. The authors examine the effectiveness of three coping strategies: focusing on racial identity to handle race-related stress, anger expression/suppression, and seeking social support. You’ve learned a bit about social support, so we’ll focus the remainder of this discussion on the potential coping strategies of focusing on racial identity and anger expression/suppression. Focusing on racial identity refers to the process by which a person comes to feel as if he belongs to a given racial group; this may increase a sense of pride associated with group membership. Brondolo et al. (2009) suggest that a strong sense of racial identity might help an individual who is the target of racism differentiate between prejudicial attitudes/behaviors that are directed toward his group as a whole rather than at him as a person. Furthermore, the sense of belonging to his group might alleviate the distress of being ostracized by others. However, the research literature on the effectiveness of this technique has produced mixed results. Anger expression/suppression refers to the options available as a function of the anger evoked by racial prejudice and discrimination. Put simply, a target of racist attitudes and behaviors can act upon her anger or suppress her anger. As discussed by Brondolo et al. (2009), there has been very little research on the effectiveness of either approach; the results are quite mixed with some showing anger expression and others showing anger suppression as the healthier option. In the end, racism-related stress is a complex issue and each of the coping strategies discussed here has strengths and weaknesses. Brondolo et al. (2009) argue that it is imperative that additional research be conducted to ascertain the most effective strategies for coping with the negative outcomes that are experienced by the targets of racism. Beyond having a sense of control and establishing social support networks, there are numerous other means by which we can manage stress ([link]). A common technique people use to combat stress is exercise (Salmon, 2001). It is well-established that exercise, both of long (aerobic) and short (anaerobic) duration, is beneficial for both physical and mental health (Everly & Lating, 2002). There is considerable evidence that physically fit individuals are more resistant to the adverse effects of stress and recover more quickly from stress than less physically fit individuals (Cotton, 1990). In a study of more than 500 Swiss police officers and emergency service personnel, increased physical fitness was associated with reduced stress, and regular exercise was reported to protect against stress-related health problems (Gerber, Kellman, Hartman, & Pühse, 2010). One reason exercise may be beneficial is because it might buffer some of the deleterious physiological mechanisms of stress. One study found rats that exercised for six weeks showed a decrease in hypothalamic-pituitary-adrenal responsiveness to mild stressors (Campeau et al., 2010). In high-stress humans, exercise has been shown to prevent telomere shortening, which may explain the common observation of a youthful appearance among those who exercise regularly (Puterman et al., 2010). Further, exercise in later adulthood appears to minimize the detrimental effects of stress on the hippocampus and memory (Head, Singh, & Bugg, 2012). Among cancer survivors, exercise has been shown to reduce anxiety (Speck, Courneya, Masse, Duval, & Schmitz, 2010) and depressive symptoms (Craft, VanIterson, Helenowski, Rademaker, & Courneya, 2012). Clearly, exercise is a highly effective tool for regulating stress. passively allowing the mind to focus on pleasant thoughts, such as nature or the warmth of your blood nourishing your body. The relaxation response approach is conceptualized as a general approach to stress reduction that reduces sympathetic arousal, and it has been used effectively to treat people with high blood pressure (Benson & Proctor, 1994). Another technique to combat stress, biofeedback, was developed by Gary Schwartz at Harvard University in the early 1970s. Biofeedback is a technique that uses electronic equipment to accurately measure a person’s neuromuscular and autonomic activity—feedback is provided in the form of visual or auditory signals. The main assumption of this approach is that providing somebody biofeedback will enable the individual to develop strategies that help gain some level of voluntary control over what are normally involuntary bodily processes (Schwartz & Schwartz, 1995). A number of different bodily measures have been used in biofeedback research, including facial muscle movement, brain activity, and skin temperature, and it has been applied successfully with individuals experiencing tension headaches, high blood pressure, asthma, and phobias (Stein, 2001). When faced with stress, people must attempt to manage or cope with it. In general, there are two basic forms of coping: problem-focused coping and emotion-focused coping. Those who use problem-focused coping strategies tend to cope better with stress because these strategies address the source of stress rather than the resulting symptoms. To a large extent, perceived control greatly impacts reaction to stressors and is associated with greater physical and mental well-being. Social support has been demonstrated to be a highly effective buffer against the adverse effects of stress. Extensive research has shown that social support has beneficial physiological effects for people, and it seems to influence immune functioning. However, the beneficial effects of social support may be related to its influence on promoting healthy behaviors. Emotion-focused coping would likely be a better method than problem-focused coping for dealing with which of the following stressors? Studies of British civil servants have found that those in the lowest status jobs are much more likely to develop heart disease than those who have high status jobs. These findings attest to the importance of ________ in dealing with stress. Relative to those with low levels of social support, individuals with high levels of social support ________. The concept of learned helplessness was formulated by Seligman to explain the ________. Although problem-focused coping seems to be a more effective strategy when dealing with stressors, do you think there are any kinds of stressful situations in which emotion-focused coping might be a better strategy? Emotion-focused coping would likely be a better coping strategy in situations in which a stressor is uncontrollable, or in which nothing could otherwise be done about it, such as a fatal illness. Describe how social support can affect health both directly and indirectly. Social support seems to have a direct effect on immune system functioning. Social support can affect health indirectly by influencing health-related behaviors, such as exercise and eating properly. Try to think of an example in which you coped with a particular stressor by using problem-focused coping. What was the stressor? What did your problem-focused efforts involve? Were they effective? Regulation of Stress by OSCRiceUniversity is licensed under a Creative Commons Attribution 4.0 International License, except where otherwise noted.